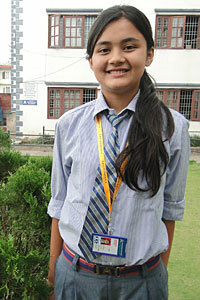 My name ist Bhumika Lamichhane (2058-03-21). I'm from Solukhumbu district - Pawai V.D.C. which is rural and still underdeveloped. I'm from farmer's family. I'm the daughter of Bishnu Kumari and Padam Lamichhane. My father and mother used to work hard for our survival. My family used to depend upon my father. He was gentle and kind. When I was 9 years my father expired because of sickness. After that incident my family was in trouble and started to struggle. I also struggle a lot for my further study. People says, sadness brings happiness. This statement is true because I got a scholarship to study in capital city of our country Kathmandu. By the help of EcoHimal organization. It is a kind of non profitable organziation which looks after the rural areas. They brought me to my new school in Kathmandu. There were many friends such us me and frome some organization. They help me a lot to improve my living way, my study and other activities. We are getting proper education, facilities and very sincere teacher. They help us a lot for our improvements. so, they are grateful for us. I'm greatly thankful to EcoHimal organization who have brought me up to here.